AKIPRESS.COM - Mongolia’s economic growth is expected to remain solid in the next two years, albeit with a slight moderation from 2018, thanks to strong domestic demand, stable services and manufacturing, as well as a recovery in agriculture performance, says a new report by the Asian Development Bank (ADB) released today. 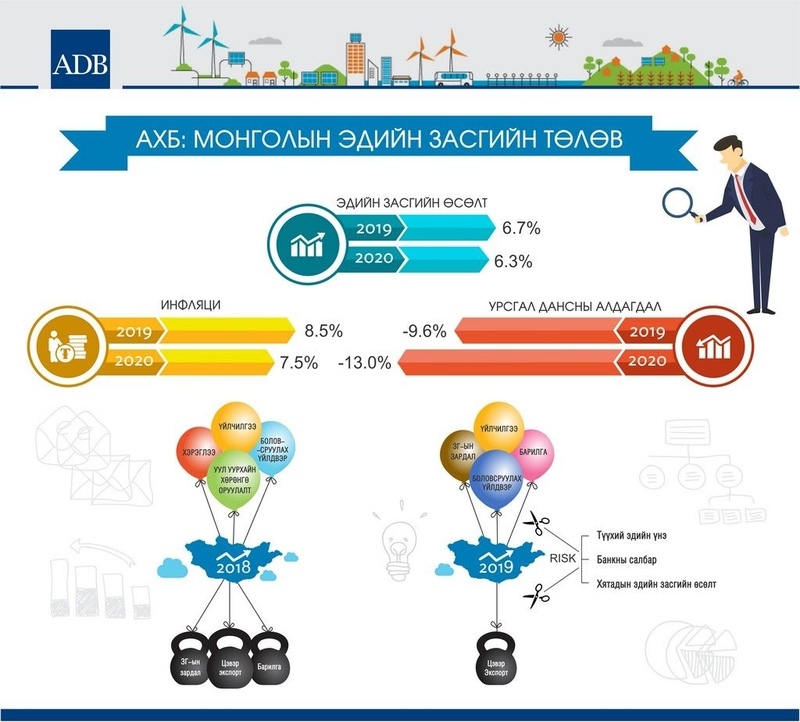 In its Asian Development Outlook (ADO) 2019, ADB projects Mongolia’s economic growth at 6.7% in 2019 and 6.3% in 2020, from the 6.9% growth rate recorded in 2018. ADO is ADB’s flagship annual economic publication. Average inflation will reach 8.5% in 2019 compared to 6.8% in 2018 due to rising domestic demand supported by higher government expenditure, as well as the effects of the togrog depreciation and higher fuel prices in the second half of 2018. These effects will be less pronounced in 2020, allowing inflation to stabilize at 7.5%. In 2019, we expect to see an increase in government capital expenditure. Revenue growth, which was high in 2017 and 2018, is expected to moderate but could benefit from any of the upside risks to the growth outlook. The current account deficit will narrow in 2019 to 9.6% of gross domestic product (GDP) from 14.6% of GDP in 2018, as exports grow, in particular on anticipated large increases in gold shipments, and as car imports slow. The current account deficit will widen again to 13% in 2020 as export growth slows and import demand remains steady. Gross reserves rose by $500 million in 2018 to equal $3.5 billion, boosted by international bond issues and foreign direct investment inflows. The togrog depreciated against the US dollar by 1.1% on average in 2018 and by 8.9% in the year to the end of 2018. Mongolia remains vulnerable to external shocks, particularly in mineral price fluctuations or lower growth in the People’s Republic of China. Despite progress in the banking sector, continuing bank fragility poses a risk to economic health.